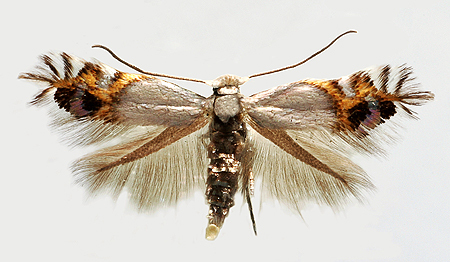 Class Insecta, order Lepidoptera, family Lyonetiidae, subfamily Cemiostominae, genus Leucoptera. Cemiostoma scitella (Zeller), Leucoptera scitella (Zeller). Oligophagous pest of rosaceous cultures. Forewings silvery grayish white, with two golden-yellow costal striae (wingspan 7-9 mm); apical fringe with 3-4 black striae; marginal dorsoapical shining spot adjacent to two wide, black lateral spots. Hindwings gray. Thorax, abdomen, and legs covered with silvery gray scales. Egg light gray, oval, concave at top. Caterpillar up to 5 mm long, grayish green, with brown head. Pupa light brown, located within white, dense, rhomboid cocoon. Pupae winter in cocoons among fallen leaves, in the upper layer of ground, as well as in bark cracks and in other secluded places. Females appear in spring, lay eggs on the lower sides of leaves far from their edges, very seldom on the upper sides. 7 to 15 eggs can be found on one leaf. Fertility is 40-80 eggs. Embryonic development lasts 9-10 days at temperatures of 23-24°C. Caterpillar gnaws through egg chorion and plant tissue, not appearing on leaf surface. Development of caterpillars lasts 15-30 days. Caterpillars pass through a self-made tunnel, which is rounded, circular, 1 cm in diameter, located on the upper side of leaf; arrangement of dark brown excrements in concentric circles is characteristic of this tunnel. Caterpillars pupate on the lower sides of leaves. Development of pupa lasts 9-16 days. Occurs in Europe (except in the North), Asia Minor, Iran, North Africa, China, and the Middle East. In the former USSR, it is distributed throughout the entire European part (except in the North), in Transcaucasia (Armenia), Central Asia (Uzbekistan, Turkmenistan), Kazakhstan, and Western and Eastern Siberia. Monovoltine species in Yakutia, 2-3 generations develop in southern Kazakhstan, and 3-4 generations develop in southern Ukraine. Last generation is always incomplete. The first generation develops from April until the end of June, the second one from June until the end of July, the third generation from July until the end of August, and the fourth generation from August until wintering. The flight of moths of the overwintered generation is observed starting in the beginning of April in Ukraine, in mid-May in Kazakhstan. Tunnels of the first generation appear en masse right after flowering of apple. Females leave pupae when they no longer need additional feeding. Unfertilized females excrete pheromone that attracts males. In winter, 33-53% of pupae perish for various reasons. A significant pest of orchards in Ukraine, the Northern Caucasus, the Central Chernozem Region, Kazakhstan, and Central Asia. It damages leaves of apple, pear, quince, sweet cherry, cherry, plum, peach, hawthorn, shadberry, biwa, and forest tree species (birch, alder, mountain ash). With an average density of 10 tunnels per leaf, premature leaf fall occurs, resulting in essential yield reduction. A large quantity of tunnels results in the delay of shoot growth and the reduction of fruit weight. Harmful activity is often, depending on the number of tunnels on a leaf, more strongly pronounced in the top layer of crones. Control measures: Agronomical measures include autumn plowing and digging of soil around trunks for destruction of wintering pupae, collection and destruction of fallen leaves in autumn or in early spring, and cleaning of old bark. Chemical methods include insecticide treatments of fruit crops during early phase of mass formation of tunnels (when their diameters are less than 0.5 cm) right after flowering of apple and repeatedly for 10-12 days. Kholchenkov V.A. 1974. Family Cemiostomidae. In: Vasil.ev, V.P., ed. Pests of agricultural crops and forest plantations. V.2. Arthropods. Kiev: Urozhai, p. 234-235 (in Russian). Kuznetsov V.I., Seksyaeva S.V. 1994. Family Lyonetiidae (Leucopteridae, Leucopterigidae, Cemiostomidae). In: Kuznetsov, V.I., ed. Insects and mites - pests of agricultural plants. V. 3(1). Lepidoptera. St.Petersburg: Nauka, p. 247-254 (in Russian). Savkovskii P.P. 1976. Atlas of the pests of fruit and berry plants. Kiev: Urozhai. 207 p. (in Russian). Seksyaeva S.V. 1981. Lyonetiidae (Leucopteridae). In: Medvedev G.S., ed. Keys to the insects of the European part of the USSR. V. 4(2). Leningrad: Nauka, p. 420-430 (in Russian). Vasil.ev V.P., Livshits I.Z. 1984. Pests of fruit crops. Moscow: Kolos, 399 p. (in Russian). © Ovsyannikova E.I., Grichanov I.Ya.